When Sir George Everest surveyed India in the 1830s, his rule of thumb was that the reflected sunlight from a square glass mirror would be detectable by the naked eye in clear air for a range of 10 miles times the width of the mirror in inches. In hazy air, you may need a larger mirror to get the same range. The mirrors most commonly used for Operation On-Target are the 12"x12" mirror tiles sold in hardware stores, either singly, or in the backpackable 2x2 tile modular design shown in the section on Operation On-Target in the downloadable BSA handbook: Varsity Team Program Features Volume II and displayed at left. The 2x2 tiled mirror at left, on a different tripod, is the very one that was used to signal 179 miles from Hayden Pk, AZ, to San Gorgonio Mtn, CA, during the Sept 2013 Operation On-Target. Retroreflective signal mirror aimers work by producing a bright fuzzy round spot in the direction of the reflected column of light from the mirror. This spot is only visible when looking through the aimer. The view through aimers we make looks like the image below. Even the brightest part of the red "fireball" is about 3 times as wide as your reflected sunbeam, so you want to pass the very center of the "fireball" across your target. The red aimers we make trace back to signal mirror aimers invented for his Boy Scouts by Charles H. Learned, a scoutmaster in Carmel, California. Those mirrors evolved to the "red washer" aimers invented by Richard S. Hunter of the National Bureau of Standards and used in the US Air Force B-1 signal mirror issued from 1945-1949, shown below (courtesy of "signalmirror" at Flickr: click Here, then scroll down there for more B-1 mirror history). The "red washer" aimers are used to this day in the glass emergency signal mirrors issued to French and Italian air force pilots, and are also used commercially in France and Spain. The glass signal mirrors in the liferaft kits of most US airliners use the (white, mesh) retroreflective aimers introduced by the US military in 1949, as do the Rescue Flash Signal Mirrors sold at the official BSA online store, the Coghlan's 9902 2"x3" glass signal mirrors, and the current-issue USAF MIL-M-18371E glass signal mirrors. ( If you intend to purchase a glass signal mirror with a mesh aimer, read the article: WARNING: Phony Glass Signal Mirrors first, to make sure you get one with a functioning aimer). DIY Signal Mirror is another excellent video on making retroreflective signal mirror aimers. We/ve tested over a dozen different types of retroreflective tape. White is too darn bright, red seems best, and most other colors are functional. The 3M™ Diamond Grade™ reflective tape works well, and is available in Fluorescent Orange (Varsity Orange) if you want to show your colors. The Harbor Freight pack makes 120 1"x1" red aimers (about a nickel an aimer). We use the left-over white tape to make reflective targets for signal mirror practice - a 4"x4" square works well at 100 yards - both the signaler and bystanders close to the signaler see the square "light up" when the mirror beam hits it. • How the "Fireball" Aimer works. The simplified diagram below gets the main point across. For a diagram that includes the effects of refraction in the glass, and of reflections of both the front and rear surfaces of the glass, see Figure 6 in US Patent 2,412,616, filed April 20, 1945, by Richard S. Hunter of the National Bureau of Standards. You have the author's permission to freely reproduce this diagram for Operation On-Target training and publicity. Double-sided mirror signal mirror aimers were used by the US Military prior to the retroreflective aimers. Over 1 million of these were issued to US forces in World War II. The signal mirrors in the life rafts of most US ocean-going vessels use double-sided aimers, and such mirrors been used very successfully for Operation On-Target for decades. Most people find the retroreflective aimer easier to use, but it is good to know how to use the double-sided type, and they are also easy to make. We've attached a few references for those interested in learning more about signal mirrors. You should be able to read them online in your browser simply by clicking on the filename in the list at bottom, or you can click on the download arrow to read or print them offline. 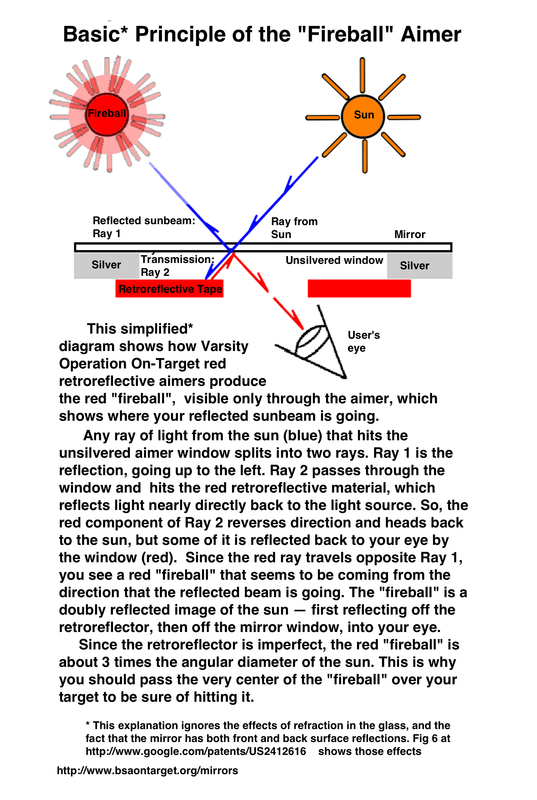 • 15_Sept44_Reflex_Button_hirez.pdf : (2pp) This (declassified, public domain) bulletin alerted US Navy pilots in WWII that their double-sided aimer signal mirrors were being replaced by retroreflective aimer mirrors, and why. It is a good resource to print as a double-sided handout, since it explains the four methods of aiming a signal mirror, and their relative effectiveness. It is from the US Govt publication, Naval Aviation News (RESTRICTED) (NAN), Sept. 15, 1944, pp. 32-33. Every US Navy pilot was expected to read NAN. describes the four popular methods of aiming signal mirrors in ascending order of effectiveness: (1) Improvised foresight, (2) Foresight, (3) Double-sided mirror, (4) Retroreflective ("Reflex") Aimer. It includes the results of the historic US Coast Guard test results that determined their relative effectiveness. • 11949_06_NAN_p35_Mark_3_Released_for_Web.png (1/4 pg) announced the introduction of the Mark 3 US laminated glass military signal mirror, issued to US troops (especially USAF) to the current day. The Mark 3 replaced the "red washer" B-1 solid red retroreflector mirrors with a mesh retroreflector consisting of mesh coated with glass retroreflective beads. The main differences to users is that the spot is white rather than red, and that there is a broader view through the aimer, since there is some view through the mesh. The most recent MilSpec for the Mark 3 is MIL-M-18371E. You can see a closeup of the back of a 2"x3" Mark3, and a photo of a USAF Thunderbirds officer holding his here: USAF Major Chris Scheibler holding his MIL-STD MIL-M-18371E signal mirror. MIL-M-18371E signal mirrors come in two sizes: 2"x3" (Type I) and 3"x5" (Type II), and are sold to civilians by the government contractor, S.I. Howard Glass, directly (wholesale - qty 100) and through distributors. • MIL_M_18371E_02_17_1969.pdf is Mil STD MIL-M-18371E: Mirrors, Emergency Signaling, Mark 3.